Hii! 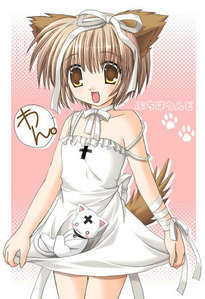 *waves* I'm Suzu Akiranashi!! I was weally bored playing with the bunny names Mr. Fluffers so I decided to make a roleplay!! Anyone wanna join? Pweaaaaase? I wanna roleplay soooo bad! You may add as many characters you want! The setting is uhh..well we can vote. What kind of roleplay is sort of up to you too!! So....*drum roll*....let's play!!!! Mood: Shy mostly but gets vewy upset when her friends get hurt! I'll play I love role playing! Personality: Shy when meeting new people, Very protective over her friends, kindhearted, loves animals. Other: Has a wolf named Kingdom. He is the demon from inside her. He is like her best friend and is very protective of her. link <--- this link is a picture of Kingdom. He is a wolf! Should we start a new forum? Or would you like to do it on this one? Suzu layed in a tree sleeping peacefully as a butter fly landed on her nose. She woke up seeing it and started chasing after it. Whinny was walking through the woods with kingdom at her side, when she saw a neko girl chasing a butterfly. Suzu poncced up trying to catch it but failed falling to the ground. She growled stalking it continuously. Kingdom walks up to girl eating berries and licks her cheek. *looks at wold and smiling petting his ears* Awww where did you come from? I'm here with my best friend Whinny. *ear perks up looking up in tree* Hm? *leaps over by your**sniffs you* you okay? *Kingdoms walks over to one that fell out of tree and licks her. * You okay? "Hi nice to meet you Valencia." "Yeah but what is it?" Whinny took out her twin swords that glowed red with the power they held. She attacked them all with fire them charged forward attacking each one. "Kingdom! Kingdom, where does it hurt?" "You should really thank Kingdom. He is the one that said you were introuble. I just followed his lead." "What will happen now that those wolves are gone?" *Smirks* "Im not letting you leave that easily." *Takes out a little golden mirror. And places a peice of blue hair on it. * "Mirror of the heavens show me where this lost soul has gone." The mirror glows gold and a picture comes up showing val running through the woods. "I'm chosing to help you Val. I'll risk my life if I want to." The two go after her.